I’ve been playing with my Simon Says Stamps March 2018 Card Kit this week. 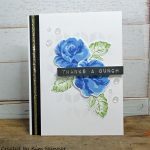 It is such a great spring inspired card kit. It has beautiful pastel and natural colors along with two fun stamp sets and pastel ink cubes that just make me long for spring. Here in the north east corner of the US, it feels like winter is never going to be over! I showed you the images that I stamped and watercolored a couple of days ago and now I want to share the final cards. You can see the original post here. For my first card, I used the floral spring boots image. This is a very sweet stamped image with one boot tipped over spilling its contents onto the ground. To finish off this card, I cut down my watercolor paper to 4 x 5-1/2″. I added a strip of the patterned green and white gingham that came in the kit to the edge of the card base and mounted the watercolor paper with foam tape to add dimension. Before mounting that onto the base, I added a 1/4″ wide piece of double sided sticky tape to the edge and added some Elizabeth Silk Microfine Glitter in Ruby over the top. I used my finger to burnish the glitter to the tape. 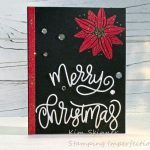 By rubbing the glitter into the tape, you prevent glitter from falling off when it is pulled out of the envelope by the recipient and burnishing it makes it really sparkle. I like to do this with all the superfine glitter. This glitter came in a previous Simon Says Stamp monthly card kit. I love that I got a full sized container of glitter in the kit. I’ve really used it quite a bit and I still have more for future projects. 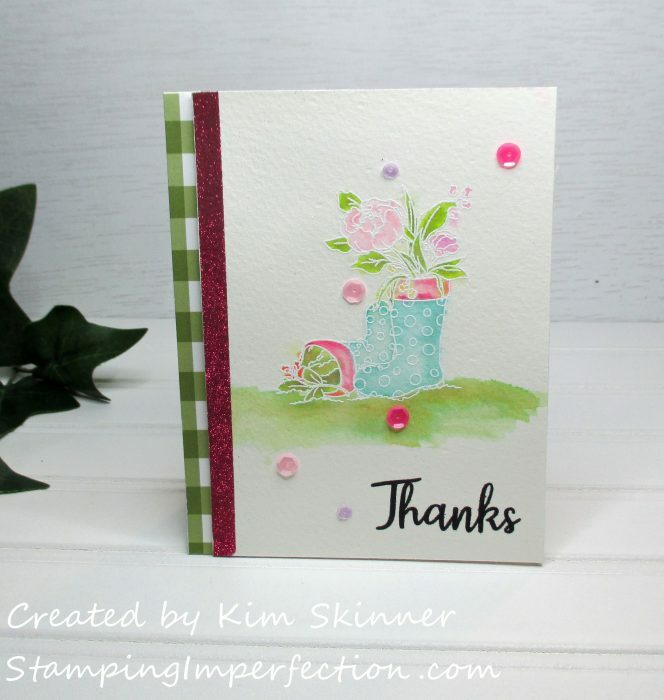 You can see that I added some Spring Mix sequins from Pretty Pink Posh and the Thanks sentiment from the stamp set. I’ve really made it a habit to use my MISTI tool to stamp my sentiments now. I tend to get it straighter and I can stamp it two or three times to get a perfectly crisp dark image. I think my sentiments look nicer now that I’m taking that extra time to use the MISTI tool. This card uses some fun goodies! My Favorite Things makes some of my favorite dies. MFT calls them Die-namics and they have fantastic shaped sets with and without the stitching detail called STAX shapes. This set is the Mod Stitched Squares stax set. I have the rectangles also and I really like them. I’ve also used some pretty plaid pastel paper from MFT as well. They have a wonderful variety of these little 6 x 6″ paper packs in different patterns and colors that I’ve been loving lately. I’ve started to move away from buying the 12 x 12″ paper packages because I’m finding that I never use all of that paper. The little 6 x 6″ packs are more cost effective and I tend to use the entire package with much less waste. Another goody that I added to this card was the Studio Katia Iridescent Bubbles. This little package came with a variety of sizes and I thought they looked like rain drops or water drops. Plus, you know that I love the iridescent embellishments! Again, I watercolored my images after stamping and embossing them in white embossing powder. I used a wet-on-wet technique with my Altenew ink cubes and an aqua painter. It’s such a quick way to watercolor an image and it’s fun to do. I have to admit that I’m embracing the imperfections as I try and practice new techniques! I send cards to friends and family who I know are always happy to receive them. They aren’t sitting there analyzing my technique (except for my sister! ), so I just have fun with it and I don’t agonize over getting it perfect. I’ve noticed that whenever I try to achieve perfection it is harder to get a project done. I like completed projects even if they aren’t perfect! Thank you so much for stopping by today! Happy crafting. Here’s hoping spring gets here soon!